A seventh candidate entered the crowded Democratic race for Maryland’s 8th congressional district Monday, as the contest to replace Rep. Chris Van Hollen in the House seat continues to heat up. All are from Montgomery County, which has the most population but the smallest land area of the district which now stretches north into heavily Republican Carroll and Frederick counties up to the Pennsylvania border. The new candidate is Joel Rubin, a former State Department official and president of a foreign policy strategy group, who has been a vocal supporter of the Iran nuclear deal as a contributor to major news outlets including the Huffington Post, Politico and MSNBC. The Chevy Chase resident must bridge a wide gap in fundraising and endorsements to catch up with the three apparent frontrunners, state Sen. Jamie Raskin of Takoma Park, former TV anchor Kathleen Matthews and state Del. Kumar Barve of Gaithersburg. Raskin last week picked up endorsements from two major national progressive groups, Democracy for America and the Progressive Change Campaign Committee. He has also been endorsed by dozens of state and local officials, including Attorney General Brian Frosh, Senate President Mike Miller and Prince George’s, and Rep. John Sarbanes . Raskin also held a lead in fundraising after the second quarter of 2015, with $553,000 raised. When the third-quarter fundraising reports are released on Oct. 15, Raskin will see if he still holds a cash advantage over Matthews, who had raised $501,000 through the end of June. Matthews, a former WJLA anchor and wife of MSNBC’s Chris Matthews, also picked up key endorsements last week from six female U.S. House members, all from outside of Maryland. Barve, a 25-year veteran of the House of Delegates, has been endorsed by House Speaker Michael Bush as well as about two dozen current and former state lawmakers. The Rockville resident had raised $291,000 through the end of June. David Wasserman, political analyst and House editor for The Cook Political Report, said Raskin and Matthews stand out as early favorites to win April’s Democratic primary, but he’s not counting out Barve. “The interesting plotline could be you could see a very heated race between Raskin and Matthews and Barve could attempt to shoot the gap,” Wasserman said. He said Raskin’s progressive track record in Annapolis and Matthews’ name recognition make them appealing to voters. Filling out the seven-candidate primary race are Del. Ana Sol Gutierrez, John Hopkins University professor David Anderson, and former Education Department official William Jawando, who joins Rubin as the second Obama administration alumni to run for the open seat. The six previously announced candidates gathered at a forum last week in Silver Spring to debate environmental issues. Each candidate emphasized the need for Congress to take greater steps to combat climate change, laying out specific proposals aimed at protecting the planet. In a district where registered Democrats outnumber Republicans 2-to-1, Wasserman said Democrats are “certain” to retain the House seat. Following last November’s Republican wave, some strategists say the Democrats must avoid complacency with their current stranglehold on the state’s congressional delegation. Van Hollen, who has represented the district since 2003, won his 2014 reelection bid by a 60 percent to 39 percent margin over Republican business owner Dave Wallace of Carroll County. 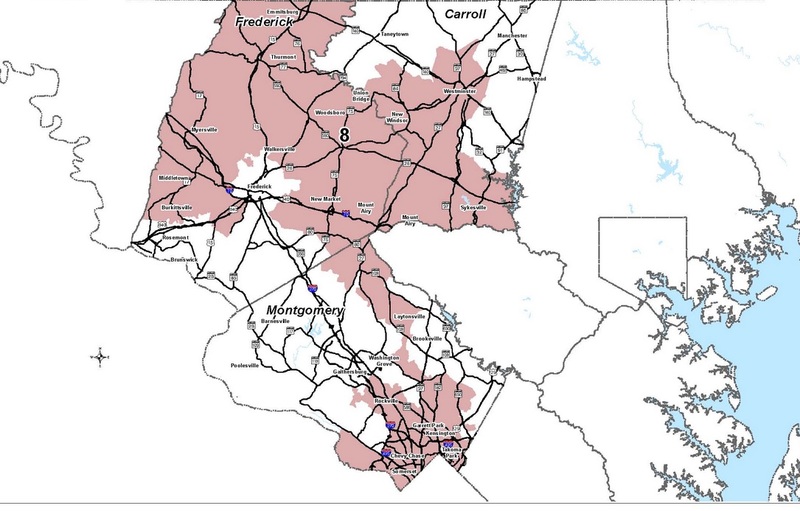 Van Hollen has been badly beaten in the heavily Republican Carroll and Frederick county areas added to the district in 2011. County Republican leaders expect that with Van Hollen not on the ballot, they will be able to narrow that margin and present a viable challenge in the upcoming general election. Republican Shelly Skolnick of Silver Spring has filed for the seat, but three local conservatives are mulling a possible bid. Attorney Bill Day of Bethesda, Chevy Chase attorney Jim Calderwood, and activist Augustus Alzona of Bethesda all spoke to Montgomery County Young Republicans on Sept. 20 about their possible candidacies. Here’s what these Democrats say about Gov. Larry Hogan in a video from MyMCMedia. “People are going to be looking for someone who is not just going to vote the right way, but be a leader for the Democrats in the House and really for the country as being aggressive at supporting the issues that residents of District 8 are concerned about,” said Madaleno. He cited economic justice, environmental issues, gun safety and social justice as some of his constituents’ top priorities. Madaleno has endorsed Raskin, his state Senate colleague.